A diving duck of open water on lakes, rivers, estuaries, and coasts, this species is identified by the long, sloping outline of its forehead and bill. The legs are strong and set wide on the body for underwater swimming. The Canvasback dives to feed on waterplants or. shellfish, reaching depths of some 30 ft (9 m). The species is common and sociable, forming large flocks in winter. It nests inland on small areas of water, such as prairie pools and marshes, and migrates after breeding to estuaries and the sea. Flocks fly strongly and fast, often forming slanting lines. 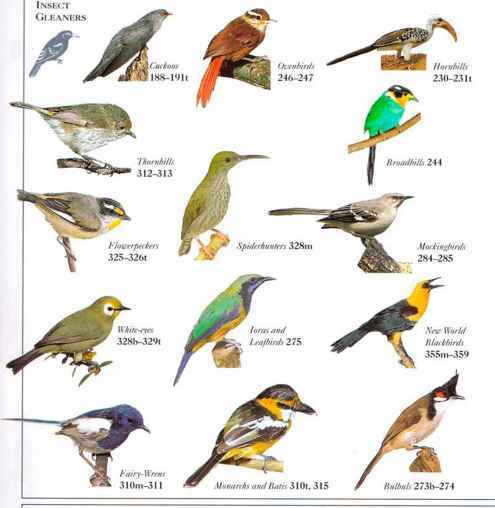 • Nest A mound of dried reeds and sedges, lined n-^fc with down, and situated on the ground. • Distribution Canada and V and W. USA. Winters as far south as Mexico. A slender crest dangling over the nape identifies this diving duck. Naturally a bird of deep, open water on lakes and rivers, it has adapted itself to live in built-up areas. 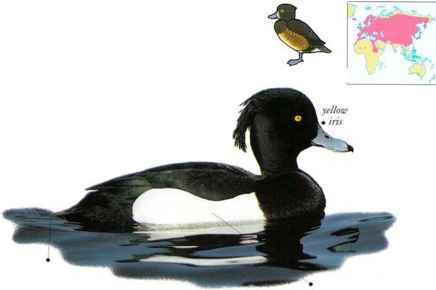 Of all the birds seen in an urban setting, the lufted Duck is unicpie for two features: males have black plumage with white sides and bellies, and both sexes have yellow, button eyes. Tufted Ducks swim well underwater, sometimes to depths of 45 ft (14 m), and feed on a wide range of tiny aquatic animals and plants. • NliST A hollow lined with grass and down, usually in vegetation close to water. Eurasia. Winters as far south as S. Sudan and n. India.